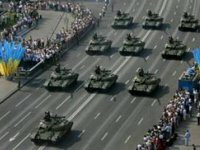 A military parade was held on the occasion of the 25th anniversary of Ukraine's independence in the Maidan (Independence Square) and Khreschatyk Street in Kyiv. The celebrations started with a performance of the national anthem of Ukraine and artillery salvos, an Interfax-Ukraine correspondent said. Columns of various branches of the Ukrainian armed forces, including the National Guard, State Border Guards and others then proceeded along Khreschatyk Street. There was also a column of servicemen from the combined Lithuanian-Polish-Ukrainian brigade Litpolukrbrig, which participates in peacekeeping operations. Columns of military vehicles then swept along the central street of the city of Kyiv, including infantry fighting vehicles, airborne fighting vehicles, self-propelled artillery systems, other artillery pieces, multiple rocket launchers, and air defense systems. Ukrainian President Petro Poroshenko and the military command of the Ukrainian Armed Forces, including Defense Minister Stepan Poltorak and General Staff Chief Viktor Muzhenko, inspected the parade. Poroshenko addressed the audience with an introductory speech. Former Ukrainian presidents Leonid Kravchuk, Leonid Kuchma and Viktor Yuschenko also attended the parade. Polish President Andrzej Duda came to Ukraine to participate in the Independence Day celebrations. Despite the drizzling rain in the center of the Ukrainian capital, several thousand came to the event, many of them wearing 'vyshyvankas', the traditional Ukrainian embroidered shirts. People lined up along Khreschatyk Street, while access to the Maidan was restricted since the leadership of the Ukrainian state and senior military officials were there. Law enforcement servicemen securing the Maidan and restricting access to it redirected people to other streets nearby.